For me, a really good biography is one about a great leader who died at least 100 years ago. To include the very much living television personality and comedian Stephen Colbert to my reading list is either putting Colbert in high praise, or lowering my standards. I claim the former. Writing about a person who is still walking the planet does have its advantages. In this case, author Lisa Rogak takes full advantage of this opportunity to explore a complicated Stephen Colbert from his roots to his unrivaled success on the journalistic spoof of a TV show, “The Colbert Report.” With comments from Colbert’s family, friends, and coworkers, even the most ardent fan will find that there is a lot they may not know about this multifaceted, multitalented, and possibly multipersonalitied man. Colbert is really two people: Colbert the Person and Colbert the Character, and a little like a good police drama, figuring out who you are watching on “The Colbert Report” or on stage can be a bit of a challenge. Ms. Rogak’s method of introducing Colbert the Person and Colbert the Character is near faultless. Not an easy trick to do when one personality seems to roll into the other as Colbert switches fore and back faster than 2012 Republican presidential frontrunners. 2) Is it Col-bear or Col-bert? Stephen was the youngest of 11 children of Dr. James W. and Lorna Colbert. It was Dr. Colbert who brought the family to Charleston, South Carolina, when he was hired as the vice president of academic affairs for the Medical University of South Carolina (MUSC). Dr. Colbert would eventually lead MUSC in to its position as a leading medical university in the United States. It was Dr. Colbert’s sense of right and wrong, his family first, and his humor that formed the family’s and young Stephen’s moral base. It was the deaths of Dr. Colbert and two of Stephen’s brothers in an airline accident that strengthened young Colbert’s connection with his mother and his strong sense of family. But Colbert never lost his love for the city or MUSC, where his father’s legacy is still honored. It is this sense of family that Ms. Rogak uses to deliver Colbert’s life’s ups and downs as he discovers himself as a person, an actor and comedian. The story flows through Colbert’s life-long friendships and collaborations, his family and his occasional disappointments; from Colbert’s dream of becoming be a serious actor to the discovery both comedy, and his transformation while working with Second City in Chicago, to the discovery of Stephen Colbert the Character. For the ardent fans who have followed Colbert from his early days on cable and “Exit 57,” this story brings no real big surprises, with his success with Second City or Colbert’s long collaboration with fellow comedians and writers Amy Sedaris and Paul Dinello. What the story does tell the reader is that great improvisation is often well planned and how much work is needed to write a daily one-half hour political satire comedy show where the host is the main and, in many cases, the only cast member. Some may not understand how hard it is to remind viewers that “The Colbert Report” is a fake news show, like The Onion is a fake newspaper. Colbert the Character is a self-absorbed, ignorant, conservative pundit, not the intellectual Colbert the Person many never get to know, but who sneaks out occasionally on “The Colbert Report.” It is Colbert the Person, the man his fellow actors, comedians and co-workers love and praise for his openness and valued comments, who is the persona we find in these pages. The man few fans ever see… except when the character and person get confused on air. Lisa Rogak’s writing is smooth and maintains an easy pace—though I did get lost occasionally when trying to figure out if I was reading about Stephen Colbert or Steve Carell, Stephen Colbert or Jon Stewart, or Stephen Colbert and any one of the others involved in Colbert’s life. Her style makes it easy for the reader to know that it is Colbert the Person and not the Character being examined. It is just unfortunate that Ms. Rogak’s release made it difficult to mention the Colbert Super PAC or Colbert’s new 501 (c)(4), the Colbert Super PAC SHH, which was incorporated the day I wrote this review. The idea of Colbert’s genius may be satire and politics, but it is this knowledge that helped start a national conversation concerning unlimited campaign funding and the American political process. It is his personae that created “The Colbert Report,”and it in that show where Person and Character overlap—all the while reviving the national conversation on American politics around the water cooler. 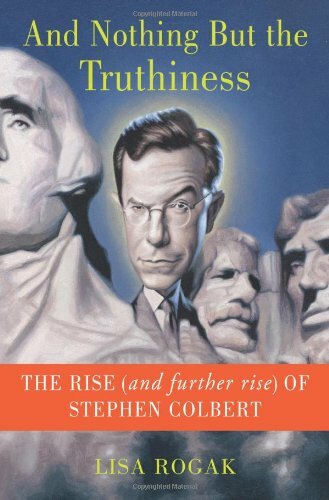 This biography could have easily been titled The Tale of Two Colberts; however, Colbert’s signature “truthiness” seems to befit the style and enjoyment Ms. Rogak obviously had writing And Nothing But the Truthiness. As for the proper pronunciation of the family name? Dr. Colbert told his children, “Do what you want. You’re not going to offend anybody.” And quite frankly, “The Col-bear Report” sounds so much more . . . truthier.